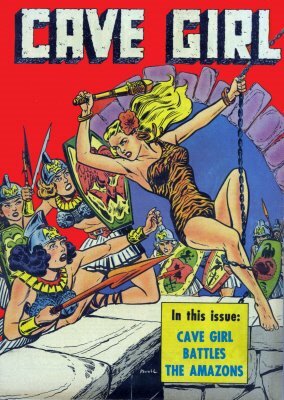 Hero Histories: The Coming of...Cave Girl! In the 1940s-50s, one of the most popular genres in comics was the "jungle hero", the most famous one of all being Tarzan. A horde of imitators followed, with some interesting variations, including an entire sub-genre--the "jungle heroine"! While many had weird names like "Sheena", "Rulah", or "Zoot", one of the best-illustrated was known only as "Cave Girl"! Beginning as a backup in Frank Frazetta's Thun'da comic, Cave Girl was a little girl named Carol, whose explorer parents were killed by natives in the jungle they were mapping. Before Carol could also be put to death, an eagle swooped down and took the child to it's nest. There, the eagle and a wolf raised the girl to young adulthood, teaching her how to survive and communicate with other animals. Though in the first couple of stories, the jungle was shown to be home to timelost creatures like sabretooth tigers and Neanderthals, by the time she got her own title, it was pretty much a generic jungle heroine strip...with one notable exception! Legendary "good girl" and romance artist Bob Powell handled the art as Cave Girl cut a svelte path thru Africa's villains from backup feature to four exciting issues of her own title! The Atomic Kommie Comics™ crew has found a home for two of her best covers on shirts, mugs and other stuff in our Heroines™ section. As a cool retro-styled gift, she appeals both to guys who enjoy seeing an attractive woman in dynamic action, and gals who like viewing an empowered woman who stands tall and proud in a male-dominated world! Talk about the best of both worlds! "Om Mani Padme Hum!" So Speaks...the Green Lama! Fear...the Fantom of the Fair!